How much notice must I give to get a dumpster? Depending on your location, normally next day availability and not usually more than 2 days in most cases excluding weekends and holidays. You may pre-book ahead for a certain date anytime in the future for your convenience. What may I put into the dumpster? Please refer to materials accepted area of webpage. Please mention the town the dumpster will be located in, in certain areas we can and try to include as many items without additional charges as possible based on the disposal site we use near you. A mix of household cleanout with building materials is never a problem. How long may I keep the dumpster? A week or less is never a problem, but we can usually work with whatever schedule you may need. Extended winter rentals are available. Do I need to be home at the time of delivery? No. If payment arrangements have been made we can drop it in any solid specified location you want. Verbal directions, Maps of site left for driver, and areas marked off with cones or recycle bins or string are some examples that have been used. If you wish you may place out 4 pieces of scrap lumber or plywood where you would like the four corners of it located and to protect the surface. 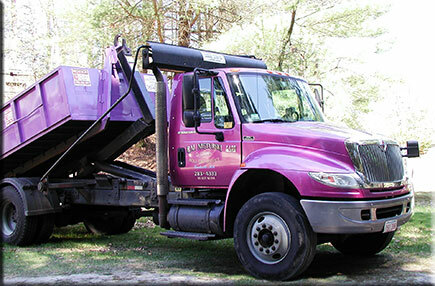 Do you provide the manpower to do a cleanout, demolition or load the dumpster? No, but we do have a contact list of qualified independent laborers or excavators for referral if you require assistance. For individual items such as a sofa or appliance, we can do removal of these items if they are outside the residence as we do not carry insurance for inside removal of single items. Your favorite form of payment- Cash, check, money order or credit card accepted before or at the time of delivery, unless other arrangements are made in advance. We accept credit card payments over the phone. MasterCard, Visa, Discover and American Express. May we bring items to you for disposal? Sorry this service is not available as we are not a licensed transfer station disposal facility.